When my sister sent her Birthday invitation and I saw that the weekend centered around a half marathon, I immediately starting hyperventilated and having flashbacks to the only other race of this distance that I completed; Boston’s Run to Remember. I trained regularly for this race, but ended up going out way too fast (my first mile was under 7:30) and completely and totally bonked! So, the thought of doing another one, was not very inspiring. 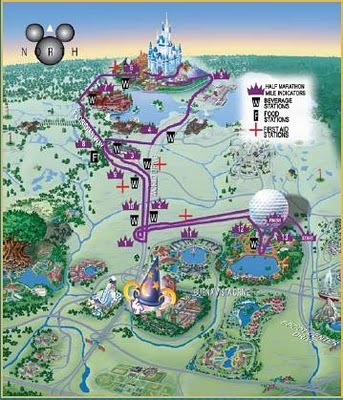 However; if you are going to put yourself through this, what better place to do it than Disney World? While I can sit here and say that I had a hard time deciding whether or not to sign up for the race, those of you who know me know that I have NEVER turned down an opportunity to be a princess. While my training improved over the weeks leading up the race, I will be the first to admit that it was not enough. I ran nearly every day, but the vast majority of this was on the treadmill and not very far (3-4 miles). I think my longest training run was a slow jog around Central Park, totaling just over 6 miles. So going down to Florida to run more than twice as much wasn’t the best feeling. Race day started early; 3:30am. After anguishing all day before the race about my outfit of choice, I decided that I couldn’t sacrificed my style for warmth (clearly a true Princess decision). I wore my super cute new running skirt from Lululemon, a tank top and a long sleeve shirt. You would think that this would be plenty warm considering we were in Florida, but let me let you, it was not! Since the race had to be completed before the parks opened, it started very early (i.e. before the sun came up). We entered our “race corral” at 4:20ish and I think the temperature was a balmy 35 degrees. We all tried not to acknowledge the fact that we could clearly see our breath. After standing around, literally standing, for an hour and a half, the festivities began. The Fairy God Mother herself stood at the starting line to wish all of the Princesses luck as we ventured out on our journey. Seeing this, I began to feel inspired. I mean, if she could turn a pumpkin into a carriage, she could certainly see me through to the finish line. 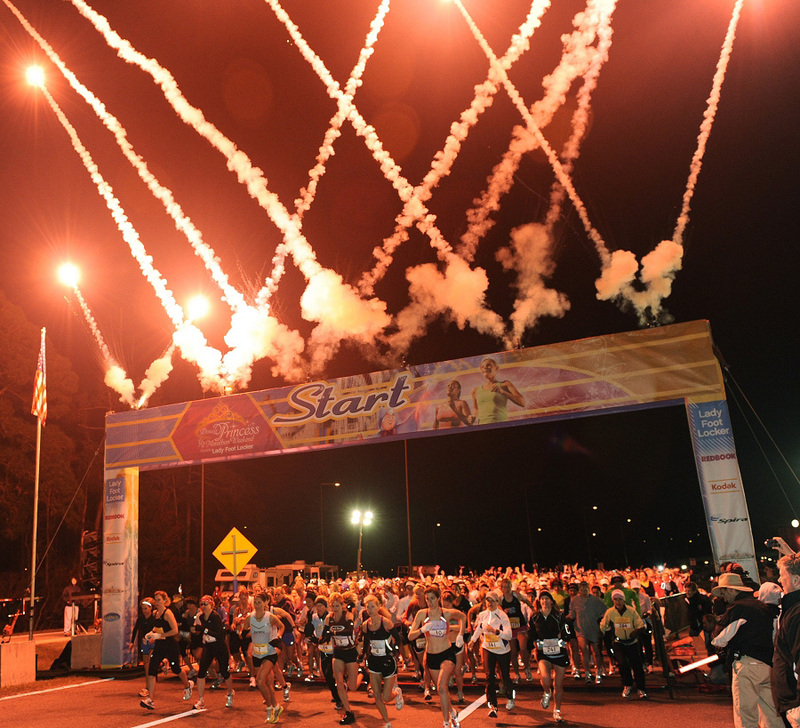 As our corral started across the finish line, we were treated to a firework celebration! The first few miles were amazing. We were surrounded by a sea of Princesses, many in costume. Unfortunately, none of us had gotten our acts together enough to wear a costume (Mistake #1), but we won’t make that mistake again next year. As we ran along the road that leads into the Magic Kingdom, we were cheered on by various Disney characters. My personal favorite were the Disney Princes who were stationed on a boat and had “I need a Hero” playing in the background. As we entered Magic Kingdom, my adrenaline kicked in and Abby and I leap down Main Street waving to the ESPN “cheer zone”. With the castle in sight, we were happy to have completed our first 6 miles. With huge smiles on our faces, we ran through the castle to the sounds of trumpet being played and waved to Mickey, Minnie, Cinderella and Prince Charming who were stationed on either side. Many people stopped to have their pictures taken with the various characters, but we did not bring a camera (Mistake #2). As we left the Magic Kingdom, to begin the long run to Epcot, I started to feel my lack of training kick in. Thankfully we had gone out slow enough that I wasn’t completely dying, but my enthusiasm started to dwindle. After a very long stretch of road running, we finally entered Epcot. The end was in sight! 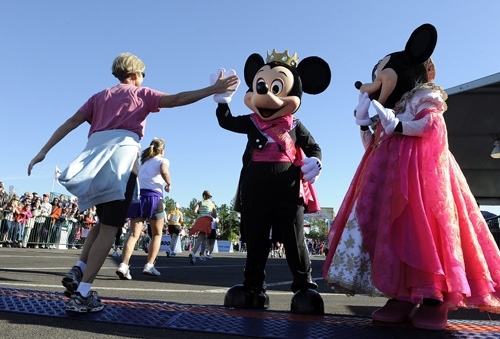 As I crossed the finish line, I was met with music, cheers and a high-five from Mickey himself! After receiving my medal, I walked over to one of the Fairy God Mother’s helpers and got “Bibbi bobbity boo-ed” (for those of you, not “in the know”, that means that they sprinkled glitter on my head) which was definitely the most exciting part of the race. My finishing time was 2:00.03; a bitter sweet finish as it was much faster than I expected, but if I was 4 seconds faster, I would have been much happier. After we had time to recover, we all decided that this was something we wanted to do again, and we were motivated to actually train next year, and more importantly, we have already started planning our costumes. i love disney world and being a princess, i want to go back!! !